mommy's reviews: Get The Look YOU Want With Clairol! I am sad to say that yes...I do have gray hair and no, I am not 30 yet. :( How very sad is that? The last time I colored my hair was in November and it didn't go so well. My good friend (a beautician)did it, and she has ALWAYS colored my hair for me. Well, the color didn't cover my gray at all. I mainly have the gray in my hairline and around my forehead. Usually, color holds really good in my hair but this time, I was in shock. I turned the layers over and my gray was there...just as gray as it has always been! Ooooooooooo Noooooooooooo...this is WHY I get my hair colored in the first place. Not because I want it done, but because I need it done! Hubby and I are trying to get out of debt as well and having my hair professionally colored is expensive as my hair is really long and thick. For a long time, I have been wanting to do my own hair but have not. Why? Because I am SCARED! LOL!!! The company I am going to review to day takes all the fear and difficulty out of coloring your own hair. Clairol Nice'n Easy makes doing your hair a breeze...and VERY affordable too! So sit back and enjoy my experiment that I did with Clairol! Clairol is about beauty at the price you want and the convenience to create that beauty in your own home. This review is all about Clairol's Nice'n Easy Hair Color Foam...a new and revolutionary way to create a beautiful look that is PERFECT for you! 5. Work all of the foam into your hair until your hair is wet. Touch up around your hairline and temples to make sure you have good coverage. Let this set for 25 minutes. I let mine go for 45 minutes as I had gray to cover and needed to make sure it had time to infuse. 7. All Done! Look how shiny my hair turned out! All in all, I was very impressed. My gray hair was completely colored and I had NONE on my head at all! YAYYYY!!! I am definitely sold on this product and it is one that I will buy again...most certainly! 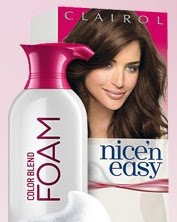 Clairol Nice'n Easy Hair Color Foam can be purchased at major retailers across the country. It retails for under $10 so that makes it SUPER affordable! Disclaimer: I received no monetary compensation for this post. I received Clairol Nice'n Easy Hair Color Foam for review purposes. All quotes are from the Clairol Website or Email. All thought and opinions are 100% mine. Stock photos are from the Clairol Website. As a hair stylist I have a love/hate relationship with boxed color. I really love how easy Clairol has made this for a novice of hair color! Your hair looks great! Your hair looks great. I love how easy the foam looks. I've only colored my hair once and it took FOREVER to apply. This seems to be a good way to go, particularly for beginners. I've done a few home colors and they were messy but effective. The foam looks fabulous and it did a great job for you! I struggle with gray too and can't afford to go to the salon anymore :( I might have to try this out! I am always concerned that it would be so messy and hard to color hair on my own. This looks so easy. Thanks for sharing. I have never colored my hair by myself before. This seems easy enough to do on my own! your hair does still look shiny! i worry about that with dyes. Your hair looks GREAT! Clairol is definitely my fave when coloring from home! This one looks so easy to use. I have been coloring my hair for a VERY long time. I started going gray at 16 :-( And now that my muscles are all shaky, it gets difficult. I now have to put towels on the floor as well. This one looks like it would be so much easier to use then the liquid. I will have to try this out.